"The "K" supercomputer, a joint project by Fujitsu and the RIKEN center, has overtaken China's Tianhe-1A system to gain the top spot on the updated list. The K computer system, currently in the configuration stage, features 68,544 Sparc 64 CPUs, each with eight cores, for a total of 548,352 cores--almost twice as many as any other system in the TOP500. The K Computer is also more powerful than the next five systems on the list combined. The system is deployed across 672 computer racks and has a power consumption of 9.89 megawatts. The K Computer's name draws upon the Japanese word "Kei" for 10^16 (ten quadrillions), representing the system's performance goal of 10 petaflops." "As a user sits in front of the Eyegaze monitor, a specialized video camera mounted below the monitor observes one of the user's eyes. Sophisticated image‑ processing software in the Eyegaze System's computer continually analyzes the video image of the eye and determines where the user is looking on the screen. Nothing is attached to the user's head or body." 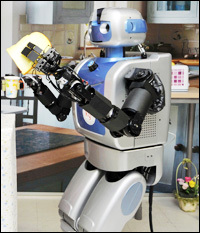 "Korean scientists have created a domestic robot that cleans up, dumps clothes in the washing machine and even heats food in the microwave." Over the weekend, 14 people were trapped in an elevator in the tallest building in the world. They were safely returned to solid ground within 15 minutes, according to Otis, the company that designed the lift for the new Burj Khalifa complex in Dubai. But the incident undeniably tarnished the unveiling of what had been called the most perfect elevator system in the world. Why are computers important in the area of cognitive psychology? 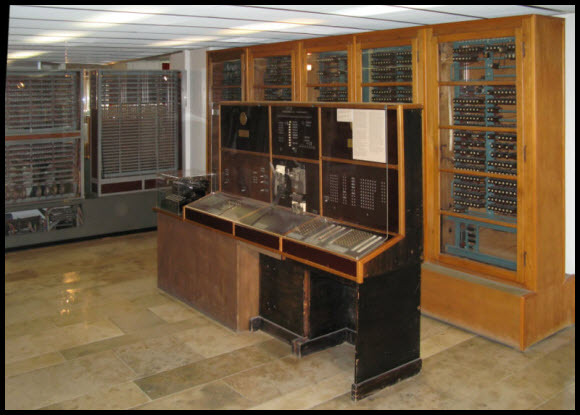 Here are some images and descriptions of the earliest computers. According to the site, "We start off with a brief history of the study of the brain. Then we describe some of the more important large-scale components and their specific functions (for example: memory and vision). We then discuss the brain's fundamental building blocks - the brain cells or the neurons. The mechanism of operation for a single neuron is outlined, and how that contributes when many neurons are networked together. We will come to the conclusion that the brain represents an incredibly complicated system with very sophisticated abilities. It is one of the aims of research in Artificial Intelligence to comprehend these processes in order to build intelligent machines." This was one of the first computer I was aware of. My brother worked for polymorphics back in the 70's. These had huge floppy disks, a walnut wood case, and green phospher monitors. They didn't do much and they cost a fortune back then. More. Continue reading The Polymorphic Personal Computer (1978). This page is an archive of recent entries in the Computer category. Cognitive is the previous category. Creativity is the next category.